NYT editors mock credible journalism, proliferating the Big Lie about nonexistent “Russian aggression,” posing the greatest threat to US security. “It is undeniable that Russia has become openly aggressive under President Vladimir Putin, who has violated sovereign borders by annexing Crimea and stoking civil war in Ukraine,” they ranted. Fact: No responsible editors would touch this rubbish. They’d forthrightly denounce it. Fact: It bears repeating. 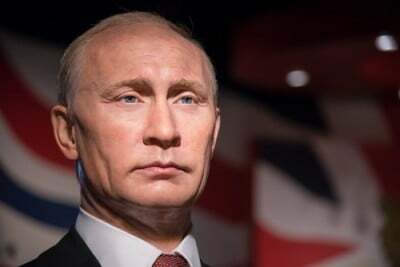 Putin is the world’s preeminent peacemaker – polar opposite Obama’s rage for endless premeditated wars of aggression, responsible for millions of deaths, countries raped, destroyed and pillaged, along with unspeakable human misery. Fact: Putin violated no sovereign borders of any country, nor does he intend to. No credible evidence suggests otherwise. Fact: Washington’s 2014 coup replaced Ukrainian democracy with illegitimate Nazi-infested putschists – waging naked aggression against their own people. Fact: Crimeans overwhelmingly voted by independently monitored referendum to rejoin Russia and correct an historic mistake. Putin forthrightly accommodated them. Fact: Kiev systematically violated Minsk I and II ceasefire agreements, bearing full responsibility for continuing conflict – with full support and encouragement from Washington. What’s most important to report, NYT editors systematically suppress, substituting state-sponsored propaganda for real news, information and analysis. Readers are consistently lied to. Credibility isn’t The Times long suit – a longstanding mouthpiece for wealth, power and privilege exclusively, the public interest be damned. They irresponsibly bashed Putin’s vital anti-terrorist Syrian air campaign. They deplore peace and stability, in lockstep with US imperial lawlessness, its endless wars of aggression threatening humanity. They consistently blame Russia and other regime change targeted nations for America’s high crimes, pure evil on an unprecedented scale. Truth and full disclosure are systematically banned from its pages on issues mattering most. Managed news misinformation and Big Lies substitute.